At last weekend’s Grand Prix of the Americas in Austin I achieved a landmark moment in my fledgling MotoGP career. Thanks to Melanie at Asphalt & Rubber, I was the proud recipient of a Honda Ruckus scooter and what a revelation it was! The ability to get from point to point with ease was a joy although I did have one small mishap, of sorts. On race day I had decided to photograph the MotoGP race from the outside of the track. I started at Turn 1 and worked my round to Turn 10. After spending a couple of laps at Turn 10, I returned to my scooter and realised I was missing one of my cameras. Two races into the start of the 2015 season and The Doctor leads the championship after a win and a third. 25 MotoGP bikes safely make their way through one of the tightest first turns on the MotoGP calendar. 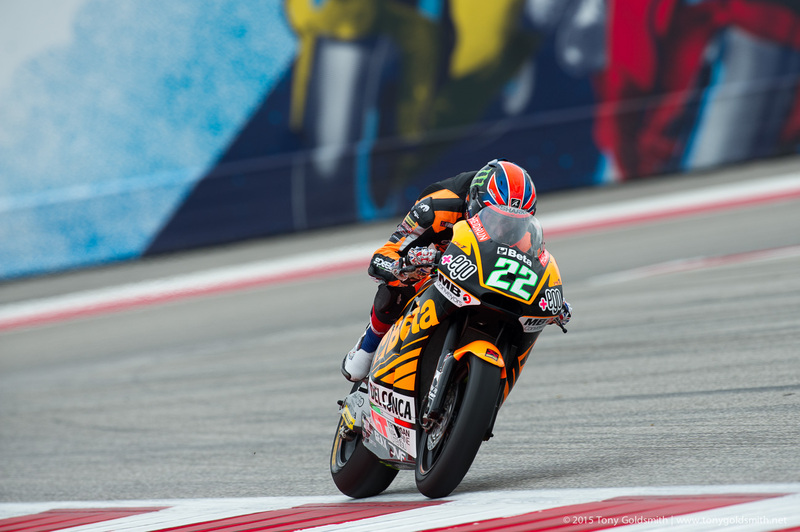 A great day for British fans as they watched Sam Lowes back up Danny Kent’s win in Moto3 with a win of his own. It was also Sam’s first grand prix victory. I have a feeling he’ll have a few more before the season is finished. Jorge Lorenzo put his troubles from yesterday behind him to qualifying on the front row for tomorrows Grand Prix of the Americas. 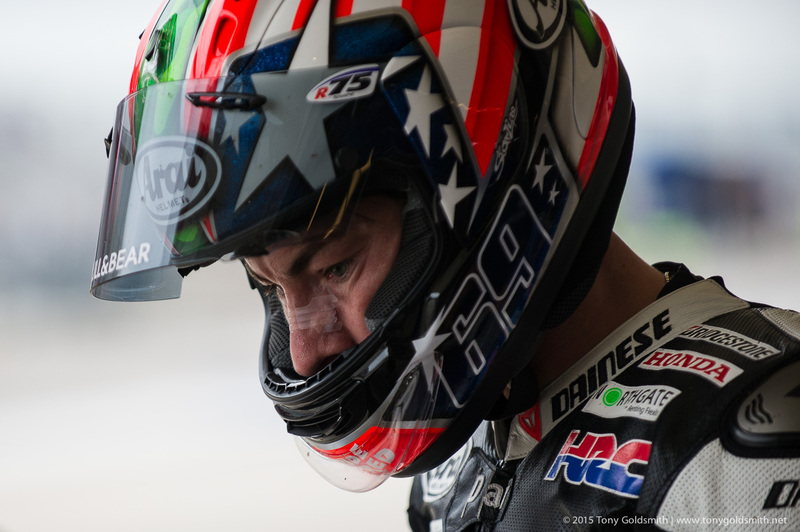 Nicky Hayden pits during FP2, balance and electronics issue have left him looking concerned. Not even with the soft tire in qualifying could let Andrea Dovizioso match Marquez’s stunning lap. Scott Redding was quick in this mornings wet session but couldn’t back that up in FP2. Valentino Rossi starts another wet lap during FP1. How low can you go? Around 64º by all accounts. I’ve arrived in Austin and settled into my digs ahead of Round 2 of the 2015 MotoGP World Championship. As I sat down to write ahead of the coming weekend, I thought back to one of my favorites times from last year. I’d had a great holiday with my partner Clare prior to coming to the 2014 race and really enjoyed the Austin experience. While thinking about the weekend I wondered as to what, if any, images still stood in my memory from last year. One I immediately thought of was the MotoGP podium selfie of Dani Pedrosa, Marc Marquez, and Andrea Dovizioso. Cal Crutchlow is to miss the Argentinian round of MotoGP at the Termas de Rio Hondo circuit. The Factory Ducati rider is still recovering from surgery on the hand he injured during the race at Austin, and is not yet fit enough to race. Crutchlow will be replaced by Ducati test rider Michele Pirro in Argentina. After his crash at Austin, Crutchlow was originally diagnosed with just a dislocated little finger on his right hand. However, when the swelling on the hand refused to subside, Crutchlow went in for further scans on his right hand in California. There it was found that the finger was still dislocated and was also broken. After three days at home following Qatar, it was time to pack the bags again and head west for the Grand Prix of the Americas in Austin, Texas. As part of my planning for the year, I had discussed with my partner Clare which races we could incorporate into a holiday. Right away Austin jumped out, particularly when Clare realized its proximity to New Orleans, a city she had wanted to visit for years. After a layover in Manchester, we flew to New Orleans via Amsterdam. Admittedly flying from the UK to the States via Amsterdam is not the most direct route, but it did save us money. Sadly the airline decided to punish our frugality by holding our luggage hostage in The Netherlands for 24 hours. On the subject of luggage, one of my main issues traveling to Qatar was the weight of my camera gear. I carry my cameras, lenses, and laptop in a backpack that can be taken on as hand luggage. Fully loaded the bag weights 15 kilos, walking around airports with that on my back literally becomes a pain. I did not have time to buy a roller bag before Austin, but I will before I travel to Jerez. After 10 busy days in New Orleans, the Mississippi River Road, the Atchafalaya Basin, and San Antonio we arrived in Austin. Having arrived in Austin at lunch time on the Wednesday I only had half a day free so we set off on a pilgrimage to visit the statue of blues legend Stevie Ray Vaughan. On Thursday I left Clare exploring Austin, picked up my hire car and with a little trepidation headed to the track. In recent years, I’ve built up plenty of experience of driving in the US, but this was my first time on my own, so I was slightly nervous. As it turned out I didn’t have any problems negotiating my way thanks to the GPS. How did people find their way before GPS? The GPS however was no help in finding the Accreditation Center. I asked one of the car park attendants, who pointed in the vague direction of a ticket office. Assuming that couldn’t be it, I drove around the car park twice. I even found myself behind the main grandstand — not sure how I managed to get there. Eventually I spotted a small sign in front of the ticket office that read “Accreditation Center.” Here we go. As a fifth-generation Californian, I am obliged to lament the decision to drop Laguna Seca, and to focus American MotoGP racing efforts on solely Indianapolis Motor Speedway and the Circuit of the Americas. That being said, while the California track is a superb race course to ride, the facilities and general location are no where close to the level that is provided by Indy and COTA. 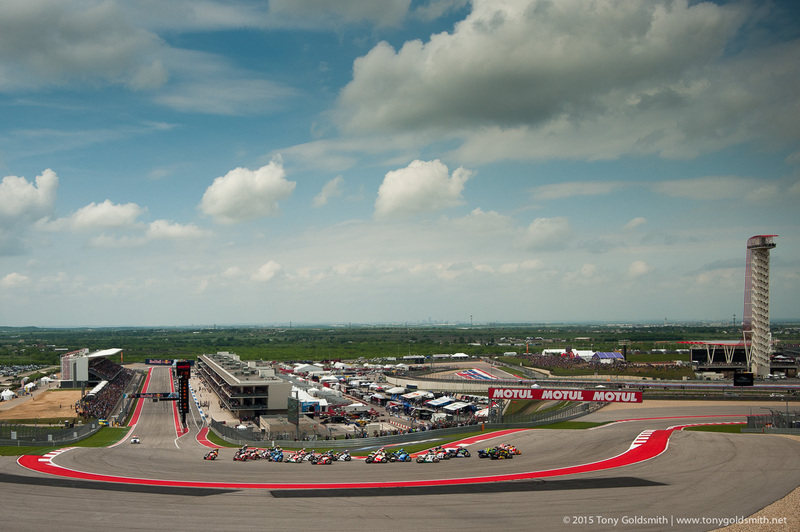 Nothing illustrates this better than the Grand Prix of the Americas that Austin, Texas just hosted. The track is simply a spectacle, and if a certain Marc Marquez wasn’t such a child prodigy, the MotoGP race would have been just as exciting at the ones seen in Moto2 and Moto3. Standing 251 feet above Turns 16, 17, & 18, the COTA observation tower provides a bird’s eye view of just about every tun on the circuit, if you can stomach its subtle sway in the wind and clear-glass floor at the precipice. Officially called by COTA as the “Observation Tower” (note the “recommended for editors” capitalization), the tower really needs a better name for casual conversation. We’ve heard COTA Cobra used a few times with some lovely alliteration, but the structure has always struck us as less snake-like, and more like a big dinosaur — we’re going to use the name “Petrolsaurus Rex” until I hear something better, or COTA sends me a cease and desist order. Nomenclature aside, the view from the Petrolsaurus Rex platform highlights the great attention to detail that COTA went to for Formula 1 and MotoGP viewing. Drawing big red, white, and blue lines along the course, a quick straw poll from photographers sees COTA being one of the more photogenic race courses (something one could not say about Laguna Seca). I climbed to the top of Petrolsaurus Rex (read: took the elevator) during the MotoGP Warm-Up session, and snapped a few photos in the process. Enjoy the hi-res photos after the jump. There’s a certain minimalist quality to having GP bikes next to long contrasting lines. Casey Stoner will not be returning to MotoGP any time soon. In an interview with the Italian magazine Vogue, Stoner said that he wanted to spend more time with his family, and experience life outside the paddock. There have been a constant stream of rumors that Stoner could return to MotoGP almost since the day the Australian hung up his helmet. They have grown in intensity at several points in time, most notably when Honda announced that Stoner would be working for HRC as a test rider in 2013. HRC Vice President Shuhei Nakamoto has made no secret that Honda would welcome the prodigal Australian back with open arms, and credible sources in Spain have reported that much work has been done to make a comeback possible, and to try to persuade Stoner to make a return. News that Stoner was to attend the Austin round of MotoGP reignited a firestorm of further speculation that he could stage a comeback at some point in the future. When I give a talk about my work, one of the things I most often hear is how much people enjoy the behind the scenes details of what it’s like to work as a photographer in MotoGP. 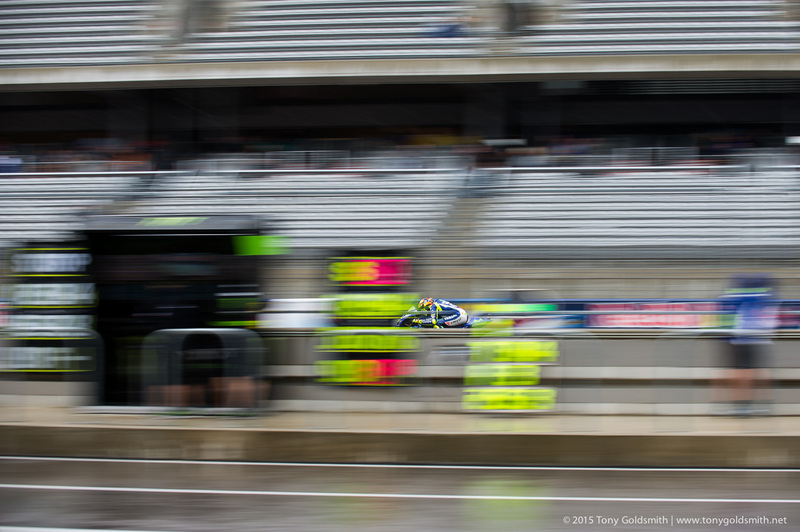 Trying something a bit different for this week’s Trackside Tuesday, I’m going to tell you some of the things that happened while I was photographing last weekend’s MotoGP in Austin, Texas. First, some background facts to set the stage. Normally it takes bad weather to shake things up in a MotoGP race. For most of the day, it looked like the rain was ready to start at any time, but in the end it stayed pretty much completely dry, bar a quick and meaningless shower just before the Moto2 race started. Regardless of what the weather decided to do, we still ended up with a bizarre MotoGP race anyway. The weirdness started even before the race had started, and continued pretty much all the way to the very last corner. 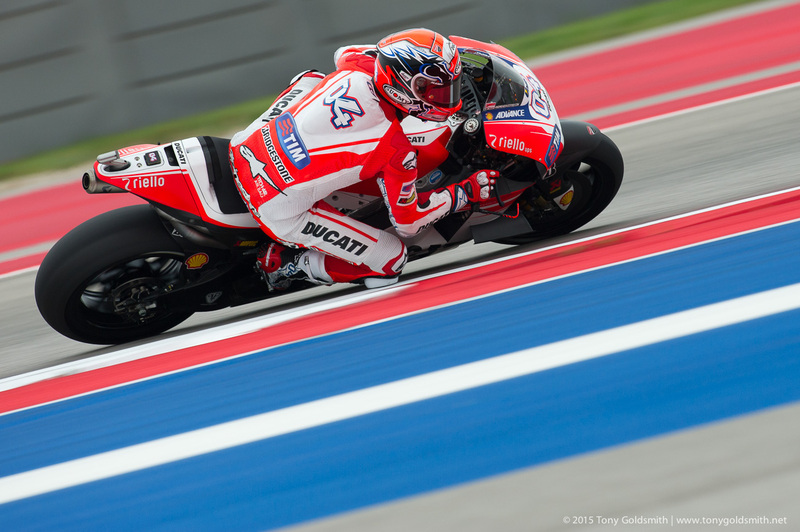 Jorge Lorenzo came to Texas knowing he faced an uphill challenge. 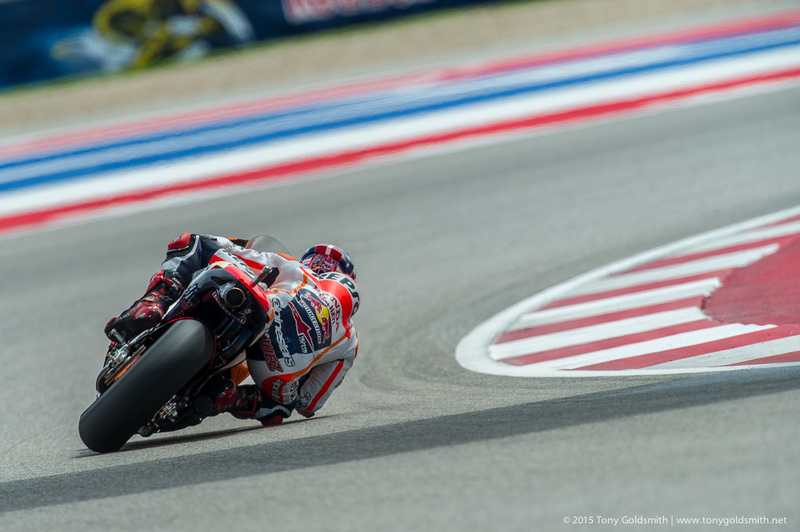 Last year at the Circuit of the Americas, Marc Marquez had run away with the race, with only Dani Pedrosa able to follow. Lorenzo had put up a valiant struggle, but had been unable to prevent a Repsol Honda whitewash. In 2014, Lorenzo had come facing an even tougher task, if that were possible. After crashing out at the first race, Lorenzo knew he had to score as many points as he could without taking too many risks. He would have to find a very fine balance between pushing hard to try to catch – and who knows, maybe even beat – the Repsol Hondas, and ensuring he didn’t risk ending up with a second zero to go with the crash at Qatar. The extra tension that created may have played a factor in what happened next. Lorenzo came to the grid with more bugs collected on his visor than usual. As he sat waiting for the official holding the red flag to leave the grid, he did something he never normally did while waiting for the start. To ensure he got the best start possible, Lorenzo decided to remove the first tear-off from his visor, to clear up his vision. While he was pulling the clear plastic strip from his visor, the official hurried off the grid ahead of the start, as the rules dictate. When Lorenzo looked back up, he saw the official gone, and in a moment of confusion, got ready to start. The start procedure specified in the rulebook states that once the official leaves the grid, the red starting lights will come on for between 2 and 5 seconds. Once the red lights go out, the race officially starts, and riders are free to chase into Turn 1 as fast as they can. That light change is crucial, the lights imprinted onto the retinas and brains of world championship motorcycle racers around the globe. Once the lights change, you go.